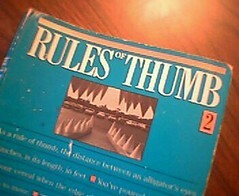 Last month, I mentioned a series of books by Tom Parker that I had loved in college, called “Rules of Thumb,” and I’d lamented that they were out of print (since I couldn’t find my old copies). Imagine my delight when a bit of closet refactoring turned up this dog-eared veteran. Passing a Car - You can safely cut in front of the car you are passing when you can see its headlights in your rear-view mirror. Planning Potato Salad - When making potato salad, figure 1-1/2 medium potatoes and one egg per person. Lowering Your Travel Risks - Pick a hotel room between the third and sixth floors. Three floors put you above street attacks and random shootings, while six floors will keep you in range of a cherry picker or fireman’s ladder if the place goes up in flames. Cooking Your Dinner - Things cooking in the oven are almost done when you can smell them in the living room. Reaching a Compromise - You know you’ve reached a good compromise if both sides are dissatisfied. Feeding Cockroaches - Twelve cockroaches can live on the glue of a postage stamp for a week. Keeping Yourself in Shoes - If you switch back and forth among three pairs of shoes, they will last as long as five pairs of shoes worn out one pair at a time. Cooking a Steak - If you want a medium-rare steak, it should be as firm as the puffy area between your thumb and index finger. If you want your steak rarer, it should be softer; more done, harder. Deciding What You Want - If you don’t know what you want, it’s probably sleep. RoT2 has 930 of these little gems of guesstimation, and, frankly, I think I could read them all day. The books are available used on Amazon (see below), but, man, I wish Houghton Mifflin would reissue all three of them as a single big volume. I’d totally buy it.